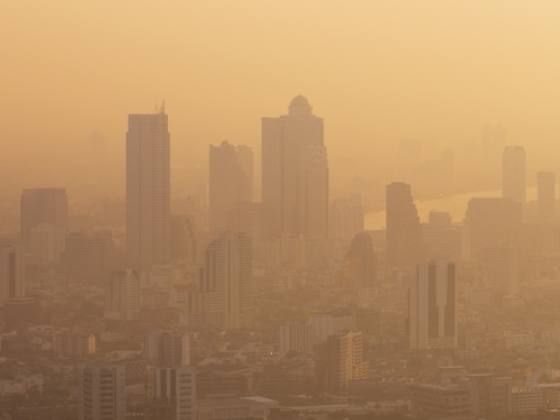 Bangkok’s recent bout of elevated pollution levels has brought attention to a group of unfamiliar terms — particle pollution, particulate matter, N95, and AQI — and provided a public wake-up call to the hazards of air pollution. People are understandably concerned about the impact on their own health, and the health of their children, and they want to know what protective measures should be considered. Here is what you should know about the dangers of particulate matter pollution, and how to guard against them. Particle pollution comes from many sources : PM pollution includes dust, dirt, soot, and smoke, and is produced from both natural (sea salt, for example) as well as man-made sources like the exhaust from cars and trucks. Big cities and industrial areas with traffic-clogged roads, factories, and a lot of construction activity tend to be more dangerous for exposure to particle pollution. But rural areas can be risky as well, from dusty unpaved roads; from agricultural pollution in the form of ammonia, which enters the air as a gas from fertilized fields and animal waste; and from the smoke produced by fires set by farmers to prepare the soil for the next crop. The smaller the particle, the greater the threat. All pollution is bad, but smaller-sized particulate matter pollution is especially hazardous to health because it is both inhalable and small enough to penetrate deeply into the lungs and respiratory airways — some particles may eventually enter the bloodstream and circulate throughout the body. The health impact is worse than previously thought : Thanks to significant research efforts during the past decade, we now know that air pollution represents a bigger health threat than we once thought. The WHO now estimates the number of “premature deaths” caused by air pollution is over 6 million people worldwide every year. And roughly 10 percent of the early deaths — almost 600,000 — are children under the age of five. Research has demonstrated that when air quality worsens, hospitalizations and emergency room visits go up, as pollution aggravates existing health problems and triggers heart attacks, strokes, asthma attacks, and more. Heart-related threats : Research has shown that exposure to particulate air pollution can lead to acute cardiovascular events, including heart attacks , arrhythmias , increased heart rate, decreased heart rate variability, and increased risk for sudden cardiac death. Recent evidence also points to a connection between long-term small sized particulate matter exposure and atherosclerosis , the condition involving a build-up of plaque inside arteries that can lead to fatal heart attacks and strokes. Lung and respiratory threats: Air pollution is both a cause and an aggravating factor of many diseases of the lungs and respiratory system, including asthma, chronic obstructive pulmonary disease (COPD) , and lung cancer . Brain threats: Long-term air pollution exposure is believed to increase stroke risk by hardening the brain’s arteries , raising blood pressure, and increasing blood thickness — all of which are risk factors for blood clots developing in the brain. You may be in a high-risk group : Particle pollution exposure is a greater health danger for children, pregnant women, older adults, and people who have heart or lung diseases. Children are considered high-risk for several reasons — and in most cases, the younger the child, the greater the risk. Children’s lungs and immune systems are still developing, with research showing that air pollution exposure hinders lung growth in school-age children. Compared to adults, children spend more time outdoors engaging in sports and physical activities. And they have higher rates of asthma and other acute respiratory conditions , which are easily aggravated when pollution levels are high. Pregnant women appear to be vulnerable to air pollution; recent studies point to a connection between high levels of particle pollution exposure during pregnancy and premature delivery, low birth weight, and increased risk of miscarriage and infant mortality. Older people face a higher risk for pollution-related problems as their immune systems are generally weaker, and their bodies are less able to offset the effects of pollution exposure. Older adults are also more likely to have an undiagnosed respiratory or heart-related condition that air pollution can aggravate. People with heart or lung diseases , such as coronary artery disease, congestive heart failure , asthma, emphysema , and chronic obstructive pulmonary disease (COPD) , are at increased risk because particles can aggravate these pre-existing conditions.